“Hida Beef” is only special brand beef which graded according to color and smooth marbled meats, and very nice savory especially among Japanese Black Cattle bred in Gifu Pref. Hida Beef is the superb delicious beef bred with great care and selected pedigree, breed, and safe feed. Delicious Hida Beef is bred by clean and fresh water that gush out of full of greenery mountains, clean air, suitable condition for breeding beef, in addition, breeder’s kindness, warmheart, and communication with beef. This Hida Beef is a exactly art. It is softness and flavor which has a texture like snow melting in the mouth. What is Hida Beef ? Hida Beef is Japanese Black cattle bred over 14 months in Gifu Pref, and a brand which is given only authorized meat quality of 5 grade, 4 grade, 3 grade beef on grading dressed carcass implemented by Japan Meat Grading Associations. * Pomegranate blossoms deals the best grade 5 of Hida Beef. 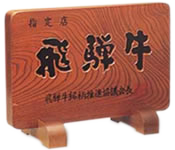 History of Hida Beef begins that Gifu Prefectural Beef Cattle Exp. Stn. 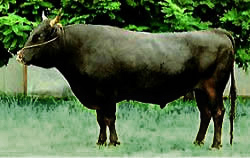 Purchased one proven bull named as “ Yasufukugo” in 1981. Since about 20 years, the administration commercial farms and fattening farms centering around Gifu Pref, and the distributor, relevant industries, and traders centering around Japan Agricultural Cooperatives, have engaged in breeding good quality beef cattle. Moreover, they overcomed the handicap as newcomer brand, and have aimed at a brand of beef-breeding center to breed attractive beef all over the country as concentrating their effort on making of characteristic not to lose existing famous breeding center. At last, they won the Prime Minister Award and the most valuable dressed carcass prize by their enthusiasm on the eighth national beef ability prize show in Gifu Pref. Now as Hida Beef established as delicious beef brand, we aim to keep supplying safe and high quality beef throughout the year. Beef cattle carried from farm are confirmed that the age of the moon is as documents by the earmark and documents. Veterinarian do a biopsy one by one, and make an examination of BSE screening, entrails, and dressed carcass after slaughter. Washed and cut dressed carcass became strict, safe, and inspected meat. Those dressed carcass are standardized, and supplied to meat trader. In Gifu Pref, you can recognize all beef information such as pedigree, breed, producer, and feeding stuff after dressed carcass certified as Hida Beef are packed by retail. In this way, thorough breed control improve safety of Hida Beef.